London is seen by Martins Bank as key battleground in which to fight for, and to win, the banking business of the great and the good. Even though Head Office is in Liverpool, having a major London office at 68 Lombard Street means Martins has people on the ground in the capital, and branches start to spring up all over London from the late 1930s onwards. The Bank takes out advertising to announce the opening of TWO new London branches within four days of each other, in February 1938. 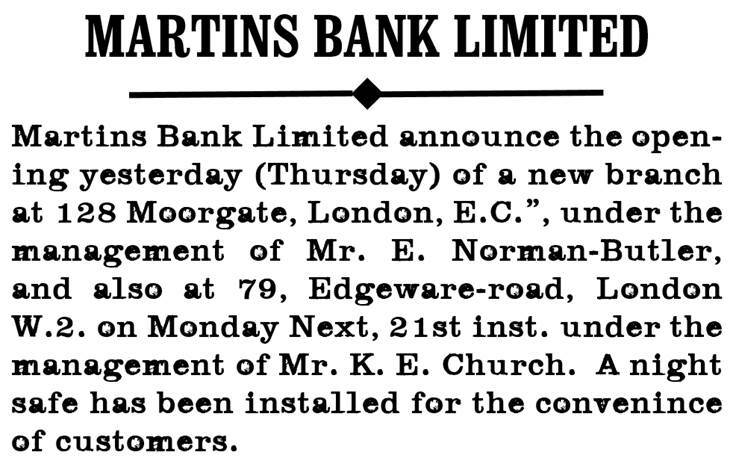 We are sorry that we have not been able to find a picture of the Bank’s branch at 79 Edgware Road, which survives until 1969 when Barclays relocates the business to its Paddington Branch. on the evening of November 27 Edgware Road branch was transformed for the entertainment of over forty colleagues of Mr Ronald Hughes, who retired as Pro Manager after 42 years' service, the last sixteen spent at that office, and all, apart from his years with H.M. Forces, in the London District. Those present included Mr S. W. P. Barter, Mr E. Parkinson (Manager) and his wife, Mr F. T. Belcher and a large number of managers, present colleagues and retired staff from the London District. In present­ing Mr Hughes with a handsome record player and a commemorative book con­taining the signatures of his many friends, Mr Barter said that he was a man who all his life had been activated by a sincere desire to be of service whenever he could and who had gained the respect and friendship of countless people. Mrs Hughes was presented with a per­sonal gift by Mrs Southin and the rest of the evening was devoted to the enjoyment and nostalgia such an occasion evokes. however PRESENT copyright holder is sought please. The new Mayor of Paddington is Councillor Denis McNair, Manager of our Edgware Road branch. Mr. McNair entered the Bank in 1922 at Huddersfield and was moved to the London District in 1937. He served with the Royal Navy in Bombay during the last war and was secretary to the Flag Officer. On his return to the Bank he went to Moorgate where he received his first signing authority and he was appointed Manager at Edgware Road in 1947. 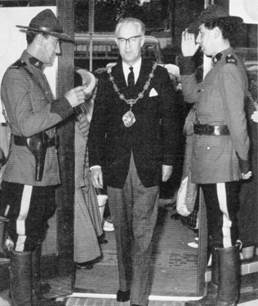 Mr. McNair's service to the Borough of Paddington has included a term as Chairman of the Finance Committee. He is Vice-President of South Paddington Conservative Association and a member of the Chamber of Commerce. He was elected to Paddington Borough Council in 1954 and has also been the Borough's representa­tive on the Metropolitan Water Board.